February 28, 2019 -- Voco America has introduced a single-dose version of its ceramic and resin cement coupling agent. The product, Ceramic Bond SingleDose, comes in a single-dose blister pack. Practitioners pierce the blister pack, then apply with the enclosed application brush. The agent does not need to be mixed before use, according to Voco America. The product can be used with a variety of materials, including silicate ceramics, aluminum oxide, zirconium dioxide, and standard composites. 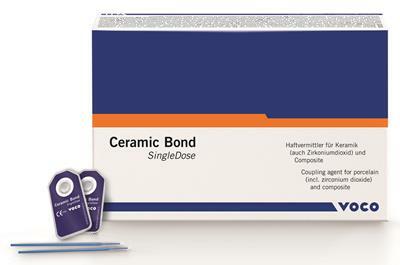 Ceramic Bond SingleDose. Image courtesy of Voco America.